Everyone knows iodine and its importance for our organism, we better know that sea water is rich in iodine. Without analyzing other aspects, it is immediately clear that our reef needs an adequate iodine provision, in order to supply metabolical requirements of our hosts. Analyzing natural salt water we observe and average concentration of 0.06 mg/l, this value puts iodine in oligoelements category. Although the extremely low concentration in relation to other elements, iodine is fundamental in lots of cellular processes for fish and corals, furthermore it enhances blue and violet colors on acropora corals. The dosage of iodine should be performed very carefully since concentrations above 0,1 mg/l can cause several damages to the reef, in particular it is harmful to bacteria. 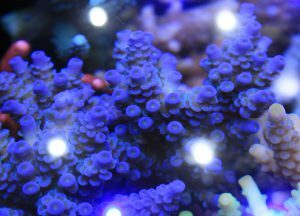 Tanks managed with basic methods doesn’t need iodine supplement, since the amount supplied by water changes is sufficient to overcome the modest adsorbing by corals and other organisms. In advanced management tanks, instead, corals can get great benefits from a constant dosage. The consolidated solution for iodine supply is the use of dedicated liquid products, made of low concentration iodine salts, usually potassium iodide. Moreover there are few iodine tests and their results are complex and difficult to read, this is due to the fact that iodine tends to assume various forms and binds a series of different molecules, so it is difficult to check the exact concentration. As for many other oligoelements, I think that th best solution is to use a dosage well below the safety margin and, hand by hand, raise till we get the desired result. 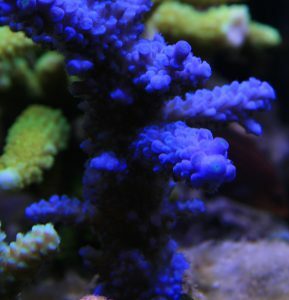 Personally I always keep an exemplar of Blue Acropora Hoeksemai, this coral is a perfect iodine indicator, indeed I noticed that in presence of good concentrations, it assumes an electric blue color with acid green corallites. 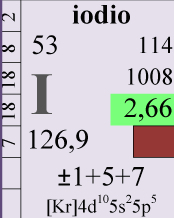 I close this brief article mentioning what I call multi-supplements: they are useful for the simultaneous integration of oligoelements. In particular I use for many years KZ’s Kaliumjodid-fluor-brom, a drops supplement containing iodine, fluorine and bromine in the form of potassium salts. Alternatively are also available iodine-only supplements.